This Haida M10 Filter Holder Kit is designed to allow for the convenient use of up to three separately available 100mm-wide, 2mm-thick filters. It can be fitted on a lens with 67mm front filter threads along with an included circular polarizer. The kit consists of three main components, an M10 Filter Holder, a filter holder adapter ring, and a drop-in circular polarizer. The aluminum alloy filter holder is pre-installed with two pairs of plastic filter slots, a configuration that accommodates two rectangular filters. Use of the filter holder can be easily accomplished by first screwing the included filter holder adapter ring onto a lens with 67mm front filter threads. 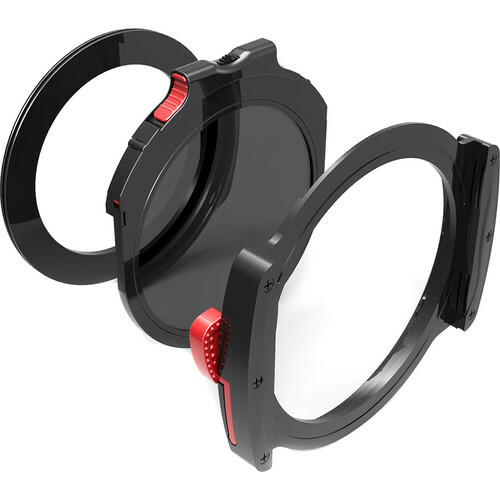 Separately available adapter rings allow the filter holder to be used with lenses that have 49mm, 52mm, 55mm, 58mm, 62mm, 72mm, 77mm, and 82mm front filter threads. After being fitted onto the adapter ring, the filter holder's push-and-release locking lever helps to provide a reliable, yet adjustable connection that allows the holder to be rotated 360°, further benefiting the use of graduated neutral density and other filters that are enhanced by varied positioning. To help prevent stray light, which could have unwanted effects on exposure, from coming in-between an installed filter and a connected lens, two gaskets are included along the front of the M10 Filter Holder. These gaskets are positioned so that, together, they form a seal between the filter holder's slots. The M10 Filter Holder also accommodates an included drop-in circular polarizer filter. That filter is mounted within a geared filter ring assembly with an external dial, which allows for the independent rotation of the circular polarizer filter in order to adjust the intensity of its effect. For still images or video captures where the drop-in circular polarizer filter is not in use, a drop-in cover is provided to occupy the filter holder's accessory slot for that filter. The drop-in cover then serves to eliminate stray light from coming in-between any installed filters and the filter holder and the lens behind it. An additional pair of filter holder slots is provided, as well as a leather case for the storage and transport of the entire Haida M10 Filter Holder Kit.